Unique Core Bore Seal. Bottom view. 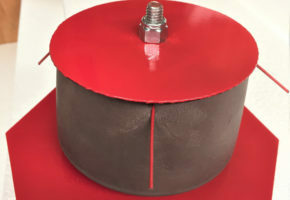 The UNIQUE Core Bore Firestop System is a revolutionary way to cover, firestop, water and smoke-seal abandoned (empty) core holes in fire-rated concrete slabs and walls. Drop it in the top side of the hole and forget it, System is completely removable if core should need to be reclaimed. 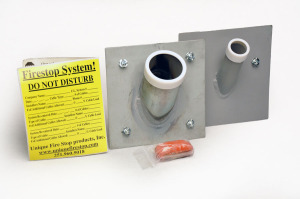 Use our UNIQUE Core Bore Firestop System to cover, seal and firestop empty core holes in concrete slabs or walls during construction and post-construction. These core holes are often abandoned when sleeves or conduits in a concrete floor or fire-rated barrier are removed. New Sizes! Now available in 1.5″, 2.0″, 2.5″, 3.0″, 3.5″, 4.0″, 4.5″, 5.0″, and 5.5″. Easy to Install with NO TOOLS! For questions about choosing the correct size, installation or anything else, call our friendly expert Customer Service Support at 251-960-5018. 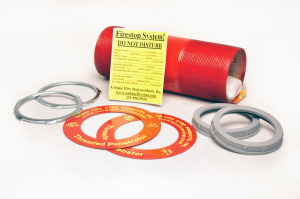 Our Core Bore Firestop System saves installation time and money while meeting all building codes. It is made of high-grade steel plate (0.60) and an intumescent firestop muffin (plug). It comes with everything needed to install it except the firestop caulk. The CBS is inserted into the hole with a bead of caulk under the top plate. This will smoke seal the CBS to the slab or wall. The top plate can be covered by carpet. System may be removed when the core hole is again needed but requires access to the floor below. Download the original AHJ Request Form . Use it for submission to the Inspector so he/she may pre-approve your proposed System. Use our awesome new form to email your proposed firestopping system specs to your AHJ for pre approval. 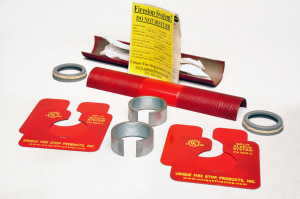 Order Unique Firestop Caulk here. 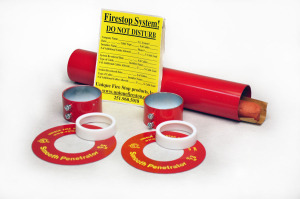 It’s the perfect general-purpose firestopping sealant for all your firestop installation needs. System currently in testing with STI intumescent plugs. Clean the top edge of the core hole with a clean damp cloth to remove all dirt and debris so a good seal can be made. Apply a 3/8 to 1/2 inch bead of intumescent fire stop caulk to the floor/wall where the Core Bore Seal will make contact. 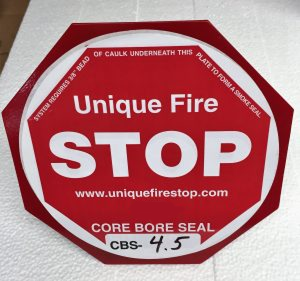 Be sure the STOP sign is up and carefully “center” place the Core Bore Seal in the core hole. The nut holds the system together and is not removed. NO TOOLS REQUIRED. Step on it. Wipe away excess caulk. ALL DONE!